All Things Reconsidered Again | Because reconsidering isn’t enough! I’m in high school. The building is huge. I’m late for math class. That’s bad, because I’m failing math. I run through hallways and up and down stairs, taking them two or three at a time. I can’t find the classroom! The clock is ticking and everyone else has settled into their rooms. I’m still running through the empty halls like a mad man. Where is that classroom? I peek into rooms, hoping to find the right one. Students are busy at work and don’t notice me. It occurs to me that I have been unable to find the room for quite some time – weeks now, and that my absences will likely cause me to fail the class. I will not be able to graduate. This started in my late teens and continued into my 50’s. I HATED this dream! Where did it come from? The seed likely germinated from the fact that I was having one hell of a time passing Algebra. So much so, I’d get up early every morning and go for extra help before school started. It was a very stressful time, and frustrating. Algebra just was not clicking for me. I did some reading on this kind of dream. Not being able to find your classroom is fairly common, it seems. Right up there with forgetting your locker combination (had that one, too, off and on). Most say that it’s simply the subconscious revisiting a time of high anxiety. One of the functions of our brain is to solve our problems; to seek solutions for what it perceives to be damaging to our mind and body. I heard somewhere that the phenomenon of seeing your life pass before your eyes when facing death is actually the mind rapidly searching for an experience that could come to your aid. I had a near-death experience many years ago and that really happens! Images fly through your head, sliding through, one after another; each one recognizable, but lasting only a millisecond. Even while asleep, our brain is on duty, sifting through solutions to problems. I stepped into the class. Everyone was there already, taking a math test. The teacher sat casually on one desks and smiled. I apologized to her for missing so many classes. She said not to worry about. I realized at that point I was my current age. My teacher, Miss Zorn was the age she was when I last saw her – mid-twenties. I was actually over 25 years older than her, but it didn’t seem that way. She was still my teacher. I was still her student. “Life experience counts toward your grade. You’ll be fine.” I will never forget those words – hell, they did come from my own brain. It’s a cliche to say that the “relief washed over me”, but there’s no better way to put it. Decades of seeking resolution came to an end. Then I woke up. I was smiling and shaking my head in disbelief. I said aloud, “I found it!” That feeling of relief in my dream carried over into my waking world. It was true elation! I felt a real sense of accomplishment. I balled my fists and shook them victoriously in the air. “I FOUND it!” I repeated. I wondered then if I’d visited that scenario for the last time. Wouldn’t it be interesting if a single resolution in a dream had the power to vanquish forever the problem that demanded that resolution? The answer is yes. I have not had that dream since. 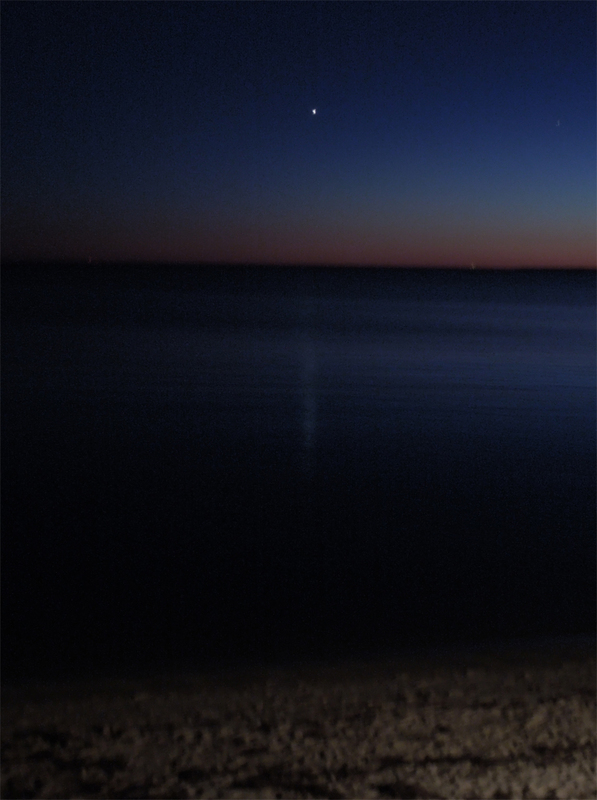 A beam of Venus’ light in Cape Cod Bay. Over the course of one month, I’ve witnessed two incredible night-sky phenomenon – each over a different bay in the Northeast. The first was “moondogs” over Winter Harbor in late August. The second occurred in Cape Cod Bay in North Truro, MA on September 28, 2013. Shortly after watching the sun set from our beachfront porch, our party observed Venus come into view directly across the horizon. It was the brightest “star” in the sky and it cast a long, pale beam on the calm bay. I have seen plenty of moonbeams on the water, but never one created by another planet! Had I been sitting in a boat in that spot, I could have read by the light of Venus. 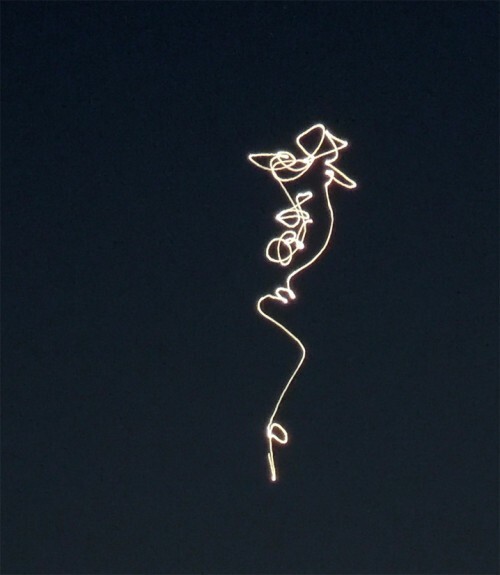 I tried to take a picture of Venus itself using my Coolpix camera set on “night portrait”, but, as evidenced by the photo below, I couldn’t hold the camera still enough. I think I need to cut back on my coffee intake. Yeah, that’s a handheld night-portrait-setting shot of Venus. As a kid, I HATED green peppers! Every once in a horrifying while, my mother would make us STUFFED GREEN PEPPERS – a meal celebrating that reviled vegetable. She was kind enough to let my brothers and me skip the offending container if we finished what was inside it – ground beef/rice/tomato sauce, which was actually pretty good. The empty pepper would be pushed as far to the edge of the plate as we could get it. Bleh! Tastes change. I eat raw fish now. Love asparagus. Onions rule! And I kind of like green peppers*. 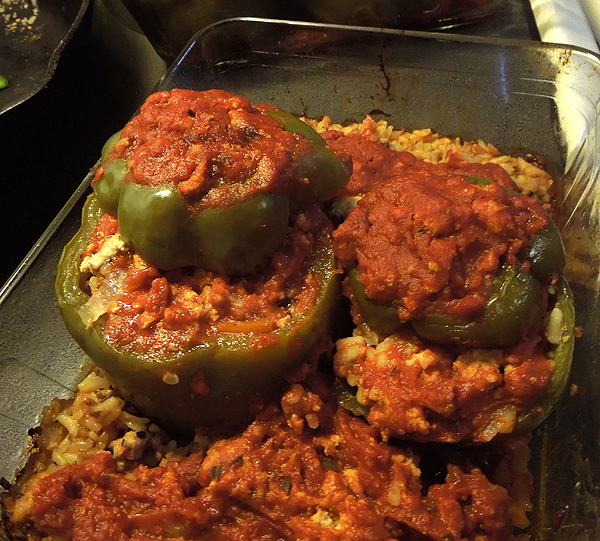 Of late, I’ve been experiencing a craving for those stuffed peppers, partially fueled by this year’s great crop of them in our garden. I called Mom, got the recipe, and made some up. Not bad! Betsy liked it, too, but…. didn’t eat the pepper. Who am I to blame her?